HomeDuplo 50: Taking the Lead with Characters. Duplo 50: Taking the Lead with Characters. This year, we are celebrating the 50th Anniversary of LEGO DUPLO. Basic brick sets first appeared in 1969, but figures were not introduced until 1977. They provided a way to introduce role play into the way that children interacted with DUPLO bricks. 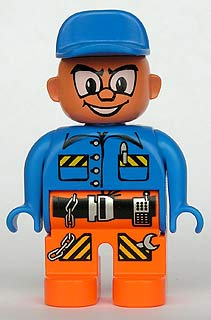 These first figures appeared ahead of minifigures, and there were then several ways in which DUPLO figures have led the way with regard to character design compared with minifigures. In this article, I will cover the changes in shape of the basic shape of figures seen in DUPLO sets since they were first introduced. I will not cover the introduction of each colour or hair/helmet mold, but I will cover the important changes that occurred in body design, as well as touch on some of the licensed figures that have appeared over the years…but only some! While DUPLO debuted in 1969, the first Duplo figures did not appear until 1977, a year ahead of minifigures. These figures were simple, finger puppet style figures, which would fit comfortably over 2×2 DUPLO Studs. With no moving ares or legs, they were similar in some respects to the ‘stage extra’ figures in use in the regular system sets at the time. With no arms, or skin tone, the art work was quite varied. Unlike minifigures, they were not designed to be pulled apart: a feature which continues to this day. One of the first sets to feature these characters was a small car, as well as a house, and police station.These figures would continue to be intermittently released, in parallel with the forthcoming style until 1990. In 1983, there was a redevelopment of the figures. Taking a lead from minifigures and Fabuland, the legs could flex at the hip (albeit as a single unit, and not independently) and the arms could move and hold onto accessories such as shovels. These figures also featured a realistic flesh tone. Something that would minifigures over twenty years to achieve ( we first saw light flesh coloured minifigs in licenced themes in 2003/2004). We can also see that these figures featured nose prints, and before long, also printed in the ‘whites of the eyes’ – something that was not routine in city for quite sometime. One of the first sets to feature the new figures was set 2634, a simple tip truck. It had seven parts- including the figure and shovel, as well as a load for the truck! In the first year, all of the heads featured hats or helmets of some description. 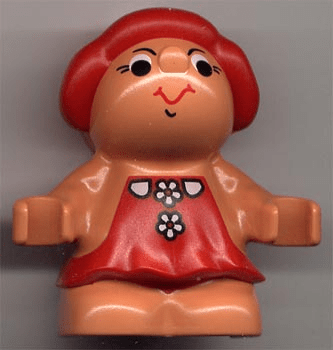 The first hair mold wasn’t produced for until 1985, and marked the first obviously female duplo figure. Male hair first appeared in 1986, as did grey hair. In 1986, Duplo introduced the first of its child molds. As well as the standard ‘hair molds’ in use at the time, there was a baby’s bonnet also available. Again, ‘short legged’ minifigures did not appear until the Star Wars’ and Harry Potter themes in 2002. Flexing hips in teenaged character figures did not arrive until 2018. In 1989, we see DUPLO’s first steps into exploring racial diversity, with the release of Dacta Educational pack: 9159-Duplo Figures International: introducing both people of colour, and of Asian appearance. A generally released Duplo supplemental pack, 2772 World People, was released in 1991. Again, in minifigures, dark skin did not appear until the Lando Calrissian figure of 2003. Asiatic features in minifigures have rarely be conspicuously defined, however they have been hinted at in the Ninja sets of the mid 90’s, as well as Exoforce, in the early 2000’s. As time progressed there was a new general figure mold introduced. Referred to as the LEGOVille figures, they had slightly more spayed arms and legs, with a more curved appearance that the previous child molds. Set 9090 – a Dacta XL Duplo set, featuring eight of the LEGO Ville figures. Returning to the established style of LEGO torso, we see a new leg mold introduced in 1994. The legs are now separated, rather than joined below the hip, just like the adults. Another new leg mold introduced in DUPLO Figures this year saw the debut of a ‘dress’ element. Although mainly released as part of the 1998 Western theme, there were another couple of appearances in the early days of the 21st Century, both in the general town set, and the Play theatre of 2002. As the 90’s came to a close, we saw some interesting developments. As well as some ‘normal’ construction based sets, we saw the introduction of Little Forest Friends – a series with a new type of figure – centred around four families of tiny characters: the Toadstools, Meadowsweets, Strawberries and Bluebells as well as some larger animals. The theme ran for two years. (Source: Brickipedia). The sets also came with a story book, allowing children to act the story out with their figures. This was the year that we saw LEGO Star Wars debut in system sets, and we also saw our first DUPLO Licensed theme in ‘Winnie the Pooh’. A favourite theme for many children, Winne the Pooh has come and gone, and come again over the years. 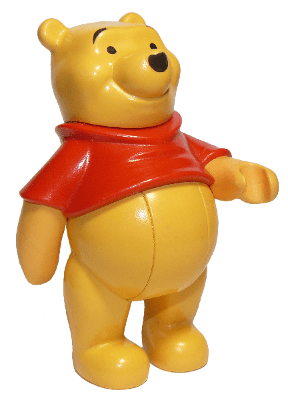 The articulation is quite variable for figures from the Hundred Acre Wood, with Winnie the Pooh having moving arms and legs, while piglet, for example is a fixed figure, sitting on a balloon with no moving parts. Action wheelers, released during 2000-2001 featured a different style of head, with more cartoonish artwork. These sets featured a screwdriver, to allow the child to attach wheels to the vehicle, and provide a degree of customisation. There was even a remote controlled Bulldozer released with this system. As LEGO approached its dark days as a company, the DUPLO line expanded to include larger dolls, who in turn had smaller versions of themselves that could be played with…by the doll, as a kind of metaplay. 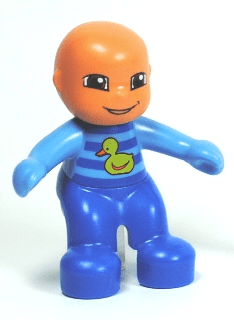 Personally, I don’t think the larger dolls fitted in with the DUPLO aesthetic, and it would appear that many consumers agreed: there was only one wave released. The first DUPLO theme to be licensed from a third party intellectual property, and feature normal DUPLO figures was Bob the Builder. The theme continued through to 2009, producing one or two sets every couple of years through the decade. His form would change slightly in 2005, with the move to the adult LEGO Ville molds. We see the return of the DUPLO Branding in 2004, and with it, the LEGO Ville figure design is embraced across the range. The children we have already seen, popping up now and again in Dacta sets since 2003, but now they are here to stay, and they are bringing their parents! We also see a licensed Ferrari Race Formula 1 Driver and team. We also see the introduction of a Castle line, releasing a variety of knights, castles and dragons across 10 sets between 2004 and 2006.We also saw a new, narrower head mold for these figures, something we see again for a non licensed Pirates theme to be released in 2006. Princess Castle sets (2005-2007) feature figures with long hair that can be combed, brushed and in extreme cases, plaited. This year, we saw the introduction of a specific LEGO Ville Baby mold. Initially in red, subsequently in blue and yellow, it has now appeared in 6 sets. New head molds appeared for the Toy story sets released in 2010, but the body molds have remained consistent, unlike the mini figures, which introduced longer legs for the Woody and Jessie minifigures. The return of Winnie the Pooh sees the Pooh, Piglet and Tigger figures follow the LEGO Ville style. 5947: Winnie the Pooh’s House. When we look at these figures on Bricklink and Brickset, it becomes apparent that the basic design of the figure has been consistent since 2004, with the introduction of the LEGOVille adult molds. We have seen a multitude of licensed themes since that time : Winnie the Pooh, Disney Princesses, Princess Sofia, Jake and the Neverland Pirates, Mickey Mouse, as well as assorted DC and Marvel Superheroes, and more! However, like the System Minifigure, there has been little change in the underlying form of the Duplo LEGO Ville figure for fifteen years. I hope you enjoyed this survey of the DUPLO Figure designs. What’s your favourite? Why not leave your comments below, and share this article with friends who might be interested. Don’t forget to follow the blog as we continue to meander through the world of LEGO… and DUPLO bricks. Images in this article are sourced from Brickset, Bricklink, and via the LEGO Ambassador Network. The LEGO 50th Anniversary retrospective at Brickvention 2018 in Melbourne, Australia January 19-20th 2019. It was put together by: Nancye Hanson, Veronica Young, Mark Young, Sky Diment, Nicole MacDonald, Mark Mitchell, Andrea Lansley and Kara Harris. ← Sydney Brick Show 2019: Last call to exhibit.